One of the best BCD maintenance tips, I have is to always to the BCD with fresh water both inside and out. Do not use any cleaners because they may harm the rubber parts. Fresh water is all that is really needed. Some scuba divers use a BCD wash to inhibit the formation of salt crystals and mold. I find the chlorine is the harshest of all the diving environments. Chlorinated water will destroy rubber and plastic parts in very short order. This is why most scuba equipment manufactures recommend having your scuba equipment serviced annually. Most divers are good about having their regulators services, but neglect their BCD. 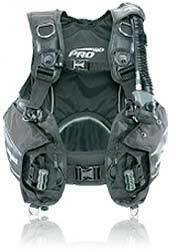 Believe it or not using your BCD in salt water is one of the best maintenance tips, I can give. Mold and fungus are inhibited by the salt water. Most of the BCD parts are impervious to salt water, it is the salt crystal that acts like an abrasive on the internal parts. These salt crystals are dissolved by the fresh water rinse. To clean the BCD, I will flush water through the low pressure inflation valve and allow the water to partially fill the BCD bladder. I will then inflate the BCD (orally), and swish the water through the BCD. Then turn the BCD upside down and drain the water back through the low pressure inflator. Don’t forget to flush water through the over pressure relief valve. One of the most innovated accessories to come on the market in the last couple years is the Atomic SS1. This is a highly rated combo unit that acts as a low pressure inflator, but also a safe second or octopus. I know Tusa and Scuba Pro also makes a similar system, but the Atomic system uncouples from the BCD corrugated hose. The female end of the unit now allows your garden hose to screw directly into the BCD; very clever. Buoyancy compensators should always be stored partially inflated. This will keep the BCD bladder from sticking together. I like to store the BCD upside down for a couple of days. Then the water will drain down into the BCD inflator corrugated hose. Depress the oral inflator and drain the water that has accumulated in the hose.